Nearly three decades removed from their most recent World Series appearance, the Los Angeles Dodgers are back. The LA Dodgers—and their Brooklyn ancestors—have played over 12,000 games since they first introduced their now-familiar, classic look back in 1938. 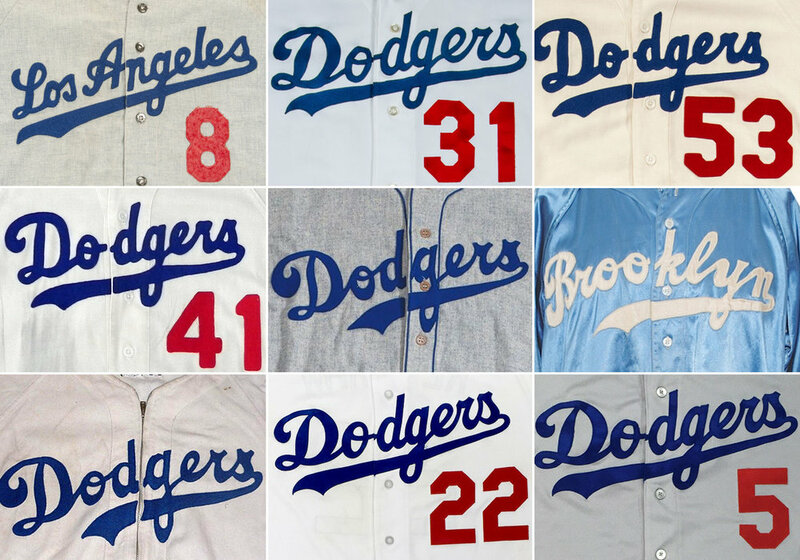 With a small handful of exceptions, the Dodger uniform has been a steady and familiar presence, both home and away, with its blue underscored script lettering. The primary team color is blue—Dodger Blue—and it's hard to imagine that it's ever been anything otherwise. While the Dodgers franchise is indelibly linked to the use of script on a baseball uniform, they were not the first big league club to use cursive letterforms. The 1914 Federal League Buffalo entry showcased their city name in script. The Detroit Tigers of the early 1930s used a script "Detroit" both at home and on the road for several seasons. But more than three quarters of a century after their introduction, the Dodgers and script-decorated uniforms are definitively joined together. The Dodger franchise has been linked to the use of the color blue since 1938. This was not always the case. The 1937 Dodgers adopted kelly green as their primary hue, a one season outlier. The team was identified by the use of red and sometimes black in the earliest days of the 20th century. Baseball innovator Larry MacPhail is responsible for making the Dodgers who they are today, at least in terms of aesthetics. He instituted a host of changes upon joining the Brooklyn franchise in January 1938, including significant revisions to the on-field look of the team. 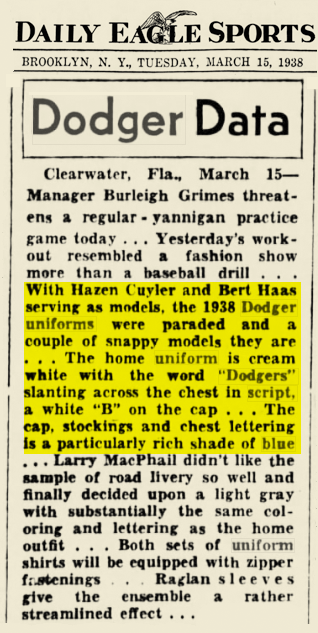 The Dodgers unveiled their uniforms on March 14, 1938. Even though this account does not mention it, the team's home caps for that one season were white with a royal blue "B." The Dodgers broke out the new look for an exhibition game against the New York Yankees at Ebbets Field a month later. The club opted to go with their road grays that day, topped by royal blue caps. The first reviews were solid, with the New York Herald Tribune opining that the Dodgers "dressed like a ball club, not like a collection of clowns." This comment speaks to the general sense of disdain for the 1937 uniforms, especially for the drab khaki road outfits that the team wore that year. The team opened the regular season at Philadelphia on April 19 against the Phillies (who were wearing yellow and blue, a look that lasted but a single season.) The home opener on April 22 witnessed the debut of Brooklyn's white home caps. A truly iconic look was thus born, and it's been "Dodger Blue" ever since. The team has worn "Dodgers," "Brooklyn," and "Los Angeles" on their road sets along the way—always in script letterforms. They experimented with satin uniforms in the early 1940s and even introduced a (short-lived) royal blue alternate uniform in 1999. The lettering has evolved over the years, and red numbers joined the script lettering in 1952. Like the Yankees' use of navy blue pinstripes, the Dodgers are solidly connected to their script letterforms and Dodger Blue. The look connects Jackie Robinson to Clayton Kershaw, with Sandy Koufax, Steve Garvey, and a host of stars in between. It spans a continent. And it definitely rolls of the tongue better than 1937's "Dodger Green." Attention Dodgers fans: Take $5 off my signed "Blue October" prints, now through November 5, 2017, with coupon code GARVEY -click here for shopping link.